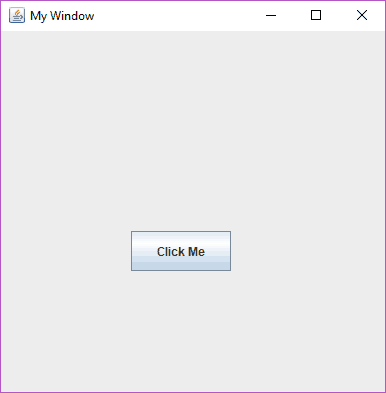 Hello Friends, In this tutorial, we will learn about JButton Click Event in java swing.In my previous tutorial, we saw how to create JButton, and if you did not see my last tutorial, then you can click on the link given below. So we have learned how to create JButton, But if we click on the button, nothing happens just because we have not added any action event associated with the JButton. So now in this tutorial, we are going to learn about event handling for JButton step by step. So Let’s start our Tutorial JButton Click Event ..
1.1 What is An Event ?? What is An Event ?? It is an object which describes a change in a source. Basically they are associated with a component. Some examples of the events are pressing a button, entering a character via keyboard, selecting an item in a list , clicking the mouse etc. Events are supported by number of packages including java.util, java.awt, java.awt.event . A source is an object that generates an Event . This happens when the internal state of the object changes in some way. A source can generate one or more types of events. A method getSource() is associated with all events which returns the object on which the event is initially occurred. It is an object which is notified when an event occurs. Listeners are java interfaces and since we are covering advance topics we must have the knowledge of interfaces that when we implement an interface by a class we must implement all interface’s methods because all the methods in an interface are abstract . Implementing an interface without adding its required abstract methods result in a syntax error . It must have been registered with one or more sources to receive notifications about specific types of events. It must implement methods to receive and process these notifications. EventObject is the superclass for all events which means it is the root of the java event class hierarchy. EventObject contains two methods. getSource() and toString(). getSource() method returns the source and toString() method returns the string equivalent of the event . AWTEvent is a subclass of EventObject class and it is superclass for all AWT events . Package java.awt.event is used for defining interfaces and classed that is used for event handling in AWT and SWING. KeyEvent Generated when input is given through keyboard. So this was the brief description of event classes and listeners, and now we will see JButton Click Event step by step in which we will learn about ActionListner interface, ActionPerformed() method and addActionListener() method. In the first step, we need to import all essential packages. In this program, we need to import another new package java.awt.event because we are dealing with event handling and this package provides classes and interfaces that are used for event handling in awt and swing. In this step, create a class (MainClaa.java in this example), and inside that class, there will be our main method. In this step, create another separate class (ActionEventDemo.java in this example). Create a user-defined method prepareGUI(), and inside that method we will set the properties of the JFrame class like its title, its location and size, its default close operation, its visibility etc. We will also change the Layout Manager of the frame’s content pane to null. By default frame’s content pane uses BorderLayout Manager as its Layout Manager. Now we will create the constructor of the class ActionEventDemo and inside that constructor call the prepareGUI() method. Now create an object of the ActionEventDemo class inside the main method. As you can see that we have successfully created our window. In next step, we will add a button to our window. 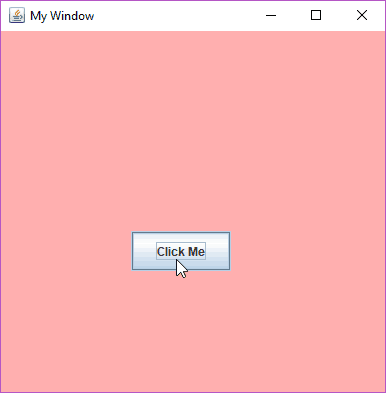 Create an object of the JButton class. Now again create another user-defined method buttonProperties() and inside that method set the location and size of the JButton using setBounds() method and finally add the JButton to the JFrame using add() method. As you can see that we have successfully created and added the JButton to the JFrame. Now we want that when we click on the button, some activity should be performed. For this, first of all, we need to implement the ActionListener interface into our class so that we will be able to do some button click event. Here is an example of how we can implement ActionListener interface into any class. If we have implemented the ActionListener interface in any class, then we must have to override its method which is actionPerformed(ActionEvent e) which takes a parameter ActionEvent (a class defined in package java.awt.event ). Now when someone clicks on the button the actionPerformed() method is called. Now let’s implement the ActionListener interface into our class ActionEventDemo. In this step, we will add or can say register ActionListener to the button. For this, we have to call addActionListner() method using the object of the JButton class. The parameter of the addActionListener() method is the object of that class in which ActionListener interface is implemented or can say in which we have defined actionPerformed() method. So if we are in the same class in which ActionListener interface is implemented, then we will pass this as an argument. Now we want that if we click on the button the background color of the frame’s content pane should be changed. For this we will write the desired codes inside the actionPerformed() method. Which means the behaviour we want in response to the action is coded inside actionPerformed() method. Now save the program, compile it and run it. Now we can see that as soon as we click on the button, the background colour of the JFrame is changed to pink. So this was all for tutorial of JButton Click Event . Feel free to ask if you have any queries regarding this JButton Click Event tutorial By commenting on this post . Thank You ?